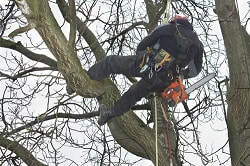 There are many kinds of tree maintenance, from pruning and trimming to major tree work like pollarding or crown reduction. In our opinion trees should be inspected regularly for disease and dead branches etc. If dead wood and diseased limbs are removed quickly, it's easier to maintain the health of the tree. Many types of tree benefit from thinning to introduce more light and air to the centre of the crown. We do everything from pruning an apple tree to tackling woodland management on a much larger scale. Although it's common for businesses and management companies to take out tree maintenance contracts, it has been more unusual for homeowners to have regular tree inspections and implement preventative maintenance. We hope to persuade you that your trees are precious and deserve the same love and care as your family and pets! We aim to bring high standards to local tree surgery and leave our customers delighted at the quality and affordability of our work. Regular tree maintenance ensures your trees remain healthy and may well prolong their lives. Fruit trees will deliver bigger harvests and mature trees will reward your care with more vigorous growth.